Continual pain and suffering is hard, especially in a world where there seems to be so much of it. Everyone suffers somehow, whether it’s family issues, chronic pain, broken relations, or the struggle against our own thoughts and actions. As Christians, our grief tends to be weighed down by the heaviness of our sin and the seriousness of the consequences. And yet, suffering and grief seem to be some of the greatest instruments God uses to reveal His eternal glory and our utmost dependence on Him. 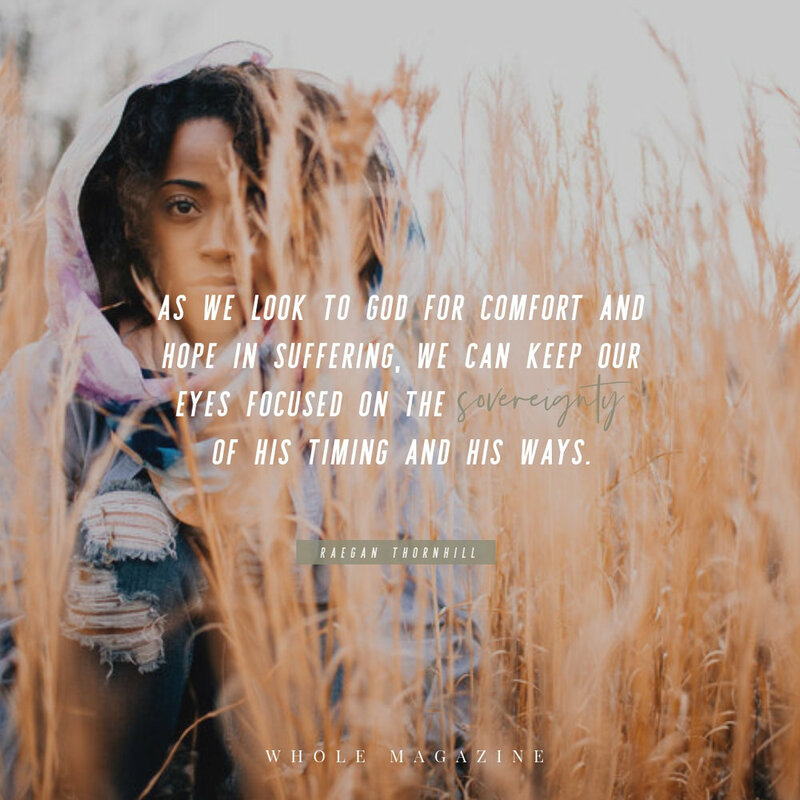 As we look to God for comfort and hope in suffering, we can keep our eyes focused on the sovereignty of His timing and His ways. Sharing our sufferings with others allows them to pray and bear our burdens together, highlighting God’s powerful, everlasting grace. It focuses the dependence we already have on God because ultimately that dependence never fully goes away. The truth is God will never give us more than He can handle…and He sent his Son to be that eternal comfort for us. While we are weak, He is strong. His love and mercy will go far beyond the hardships of this world. We can hold tight to the fact that the temporary sufferings here on Earth are nothing compared to the glory that’s to come. Most merciful Father, thank You for being that never-failing and never-ending comfort in my life. Help me to look to the cross not only while I’m grieving but also when I am rejoicing. What do you learn about suffering in the Christian life in 1 Peter 1:6-7? Meditate on the fact that our grief and sufferings are temporary, but the comfort Jesus Christ gives us is eternal and never-failing. How Do You Train for Godliness? Are Your Worries Rooted in Idols?